Manage all aspects of in-home caregiving. 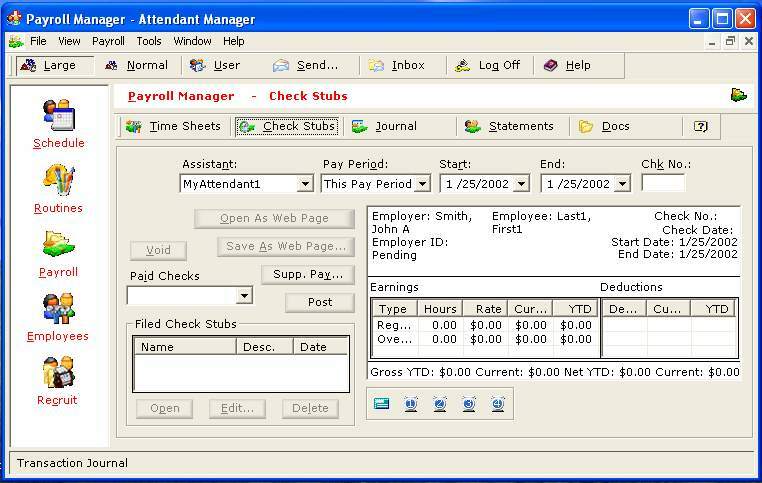 Monthly schedules, checklists, routines, needs assessment, time sheets, check stubs with itemized earnings and deductions, training manuals, payment tracking, financial statements, record keeping, job descriptions, job applications, interview sheets, evaluations, recruitment contacts list, and online recruitment through http://www.AssistantPages.com - all this happens automatically. Attendants enjoy time sheets, checklists, training manuals, messaging system. Other features include a remote workstation, urgent contacts and instructions, and data backup and optimization. For U.S.A. users, updatable Federal taxes. Detailed guides on maintaining personal care and managing attendants. Comprehensive built-in in Help system to make the program easy to use. Enhanced accessibility features include one button access keys and enhanced focus indicators. Register for indefinite use after the trial period. Support for Windows 7, updated tax features, improved Registration, and miscellaneous improvements and fixes.